At. St. Paul’s, we truly believe that “Music is a fair and glorious gift of God.” (Martin Luther) We have musicians of all ages and ability levels who love to come together to sing praises to the Lord. If you are interested in joining a choir or would like to share your musical gifts with us at St. Paul’s, please contact Kris Fosbenner for more information, or simply come to a choir rehearsal! More information about our choirs can be found below. Cherub Choir (age 4*-grade 2) rehearses Wednesday nights from 6:30 pm – 7 pm throughout the school year. 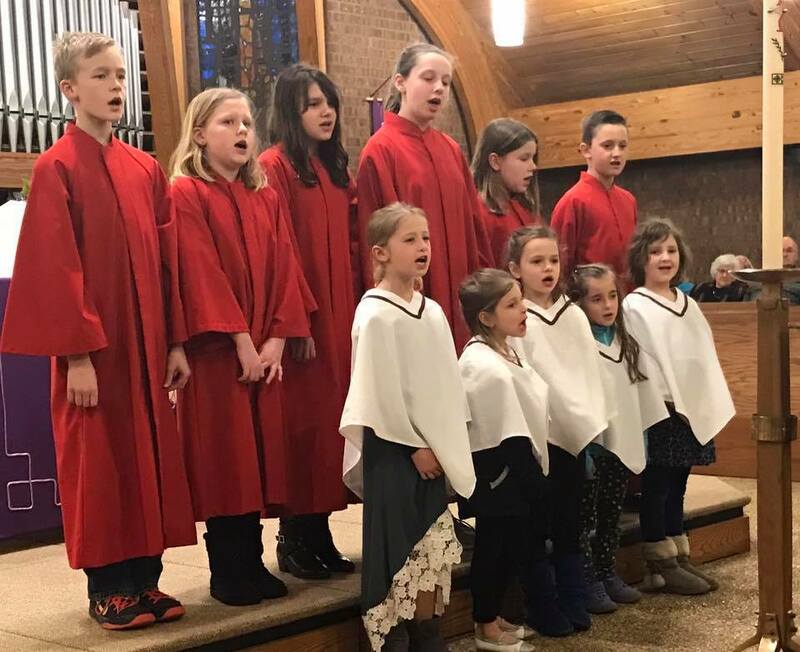 In their rehearsals, Cherub Choir members work on developing singing skills while deepening their faith as they learn anthems, hymns, and liturgy. The half hour of rehearsal time buzzes with activity as singers move to music, play instruments, and enjoy musical games designed to strengthen musicianship. The Cherub Choir sings about eight times a year, usually at the 10:45 service. *must be four years old by the beginning of the choir year. Red Angels Choir (grades 3-6) rehearses Wednesday nights from 7 pm-7:45 pm throughout the school year. These 45 minute rehearsals are packed with learning as choir members prepare anthems, liturgy, and hymns for services. Singers also work on developing vocal technique, following a conductor, and learning to read choral music. The anthems they learn provide a springboard for Christian education as texts are discussed and related to the lectionary or season of the church year. In addition to singing, Red Angels Choir members learn to play handbells during the weeks leading up to Christmas. Although this is a hard-working group, there is time for laughter and fun during their rehearsals. The Red Angels Choir sings about eight times a year, usually at the 10:45 service. Our children’s choirs provide wonderful opportunities for an “extra dose of music” in a spiritually nurturing environment. They help lead worship and sing during our 10:45am service approximately once a month. Children may join a choir any time during the year. Children who sing regularly at an early age strengthen the musical foundation that is needed to succeed as a band, orchestra, and chorus member later on. And singing in a choir is fun! The St. Paul’s Chancel Choir is a welcoming community bent on fellowship and praising the Lord with song! Any and all are invited to join; a desire to sing is the only requirement. As part of the Church Congregation it is the choir’s duty to provide weekly music and help lead Sunday services. Their repertoire is fun and diverse and includes everything from Gregorian Chant to Spirituals to Contemporary Praise music. Rehearsals run Thursday evenings at 7:30 September through May.